In Hollywood It’s Tour, Tour, Tour! Hollywood … glamorous, glitzy, star-studded, bustling, colorful, vibrant, interesting, action-filled, fantastic, electric, bright, dynamic, historic and trendy. Yes, Hollywood is all of these things. But it’s more than just a glamorous spot on the California landscape — it’s a place that also lives in our imaginations, as well. And when you visit Hollywood the way to get close to both the real and the imaginary is on the tours. In Hollywood it’s the tours that make all the glitz and glamor and craziness just grow on you, leaving you craving for more! Once you’re hooked on Hollywood touring you can never stop. So do yourself a favor and don’t budget on tours, take a bunch of them. For many, Grauman’s Chinese Theatre is “visitor central” and the Starline Tour Kiosk there has amazing tours that make you feel you’ve “really been to Hollywood.” We did the hilarious TMZ Hollywood Tour first, billed as dishing out the “Secrets” and boy, did we get the lowdown on this “show on wheels” from Luke Artervurn, a great guide who doubles as a TMZ star photographer. We don’t want to give it all away, it wouldn’t be fair to spoil your fun. Just do it. “It’s all about New Hollywood, and is heavy into pop culture, a tongue-in-cheek journey into the wacky celebrities,” quips our good friend singer Jimmy James, who moved here a few years ago from New York City, and loves places like convenient Melrose Diner. But for vintage Old Hollywood, which is great for those 50 years and older (and their savvy family who like TV and Turner Classic fare), we definitely recommend the Movie Stars’ Homes Tour (our fantastic Starline guide Bruce was an encyclopedia of celeb knowledge!). It was beyond one’s wildest imagination, seeing dozens of mansions of those we adored, including Lucille Ball’s beautiful home and the house where Clark Gable lived, and of course, the homes of dozens of living stars also. It was even cute riding on beautiful Mulholland Drive (what a view!!) and seeing where the stars walk their dogs at Runyon Canyon Park. You get the open-air breeze (blankets provided if you need them) and the most eye-opening, pleasurable ride of your life! 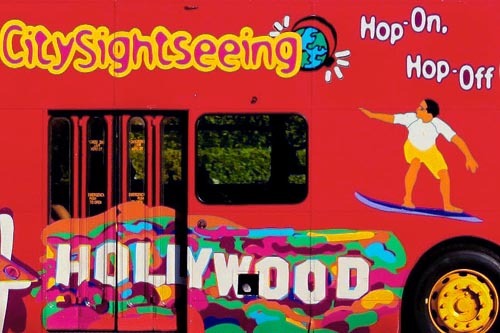 For getting off at many stops (such as celebrity hang-outs in West Hollywood or on Rodeo Drive, Beverly or on Melrose, even eating at the Farmer’s Market or at The Grove), do the Hop On/Hop Off with Starline Tours. And for getting more-in-the-know, take the Malibu Star Homes Tour, the Warner Bros. Studio Tour, even the Hollywood Trolley with Starline for a joy-ride. You’ll have plenty of memories re-ignited when you see places such as Capitol Records, the Roosevelt Hotel (where JFK and Marilyn supposedly rendezvoused) and other famous landmarks. Hollywood Boulevard is where the visitor action is, and where most of the tours begin. Excitement and glitz is contagious all along it. Just as exciting, though, is meeting some of the locals. We found talented jazz trumpeter Haji Ahkba, dressed up in his finest, playing his nightly gig in front of Oz tattoo parlor on the boulevard between Las Palmas and Cherokee. At another spot we met Ashin Wara, a monk from Burma, who had made his way to Hollywood to fulfill his dream. “Every people should come here,” he told us. “Take your picture with the famous names in their stars on the sidewalk. I walked on the right and the left sides of the street to look for stars and found my favorites: Diana Ross, Jackie Chan and (Canadian rock star) Bryan Adams”. Grauman’s is the place for amazing people-watching. Here visitors from all over the world pose with costumed characters in the dress of Marilyn, Elvis, Batman, Spiderman, you name it, while wandering to find their favorite movie, TV or singing star’s name in a star on the Hollywood Walk of Fame. It’s here where they also get photos of themselves with a most authentic attraction: shoeprints and handprints of famous stars. We did that also, right before running off to catch another tour. All Hollywood tours depart from Starline Terminal forecourt at Grauman’s Chinese Theatre, 6925 Hollywood Boulevard. Wow — these bus tours sound so lively and exciting! I’m glad I found this story: Carla and Jason Rupp convinced me that the next time my friends (well, they’re all ages, but I’m in the over 50 crowd) and I are in LA, that we are all going to look for the Starline Tours buses. I’ll sign up for sure at the kiosk because I want to experience what these people on these tours experience. Can you just imagine if we bump into Betty White, who some people are trying to draft to run for President of the United States, what a photo op that would be?! I am especially interested in the TMZ Starlines Tour, seeing Molholland Drive on the Movie Stars Home Tour and viewing the handprints and everything at Grauman’s Chinese Theatre. I love the crazy and wackiness you can experience if you just keep taking what sounds like expert, adventure-filled tours. I like the idea that the guides probably really know a lot of good information and I can see the city from a different angle than I’m used to, the glitzy side. The things that this story tells you, that can experience, makes it sound like so much fun! Thanks for sharing this article. It makes the possibilities I had not thought of to have a more enjoyable trip while I’m in LA the next time. Thanks for writing this great article about Hollywood! We love to hear from visitors so we know what we’re doing right and what we can improve upon. And since we are plugging our own products (!) stop by http://www.nrbooks.com and check out “The Ultimate Hollywood Tour Book” by William A. Gordon. It is the bible of Hollywood sightseeing industry and has all the sites not on the main streets the buses take you to. You will find dozens of movie locations, celebrity homes, scandals, murders, and suicides, and sites that inspired songs. It covers all of L.A. from Pasadena to Malibu. I really enjoyed this piece! I hope to see more like this. Thanks so much for including Hollywood CityPASS in the “If You Go” section of your story. 2012 Hollywood CityPASS ticket booklets cost $59 for adults and include admission tickets with a combined value of $108.90 (so, travelers save about 46% off purchasing the tickets individually). Hollywood CityPASS ticket booklets include admission to the Starline Movie Stars’ Homes Tour, Madame Tussauds Hollywood, Red Line Tours “Hollywood Behind-the-Scenes” Tour, and a choice between either the Dolby (formerly Kodak) Theatre Guided Tour OR The Hollywood Museum. Thank you Deborah for telling us about the good value of the Hollywood CityPASS. Those attractions are all really important to get a good Hollywood touring experience!